The decision to take the Russian GP to Sochi instead of Moscow could prove to a good one, as it seems that the track will wind around the 2014 Winter Olympic Park, where events such as ice hockey, figure skating, speed skating and curling will be held. It was confirmed today that the race will be held from 2014-2020, with an option to extend. A map that has emerged on the net via Russia’s F1news website shows a track – apparently designed by Tilke – making full use of the Olympic site and some public roads. Given that the Olympic Park is still being built the organisers can in effect construct access roads and so on with the race in mind, so that there should be a seamless transition to a Grand Prix venue just a few months after the Games. However there is some suggestion that the debut may be put back to 2015. And it also means that there will be facilities such as a broadcast and media centre on site, not to mention good transport links. One overtaking spot, maybe two at a push? Blimey! How many more races can we fit into a season? Do you think we already have too many races? When is it finally time for someone new with some original ideas. I like it. I’m seeing bits of Monaco and Sepang and Aragon showing through. If is it indeed designed by Tilke, it’s certainly a departure for him – it looks very fast. I doubt the claims that the race will be delayed to 2015, though. As you said, the circuit will be worked into the Olympic Village, so if it’s ready for the Olympics, it will be ready for Formula 1, even if all the Russians need to do is erect barriers. All these rumours of New Delhi and Austin and now Sochi being delayed are no doubt coming out of Korea’s problems. Formula 1 fans are funny like that – as soon as something happens to someone or somewhere, we all suddenly believe that it will happen to everyone, everywhere. I’m also doubting the claims that a race will have to be sacrificed for the Russian Grand Prix – Bernie might have said that 20 races is the maximum the calendar can hold, but he has previously said that 16 was the most Formula 1 could manage. If Bernie wants 25 races (or whatever figure pops into your head), then Bernie will get 25 races. That pit lane looks awful small, though. If it’s to scale, then the rest of the circuit must be very large. Which means some of those straights are going to be monsters and those long corners are going to be fantastic. I especially like the way the first corner is a flat-out right-hander. How many circuits around the world have a first corner that is not designed as an overtaking point, much less one that is high speed? Silverstone and Magny-Cours are the only ones I can think of. I also really like that left kink after that long, arching corner across the back. PM, I think you’ve got it right; if the drawing is to scale and accurate. It’s a definitely something different from Tilke. Makes me think the drawing is wrong! Wonderful. It looks like any other unimaginative Tilke-drome out there. People can talk about lack of overtaking, spiraling costs and what not but the reality is that Tilke-dromes are the real cancer that is killing F1. They produce processions which lessens interests and leads to lower viewers. Events end up with horrible reputations such as Valencia. I’m convinced that Tilke gave the Istanbul track design to some junior intern. The how do you explain the way Suzuka and Spa and Silverstone and Monaco throw out processional races? It’s easier and cheaper and more effective to change the cars than it is to change the circuits. Why does Hermann Tilke get so many contracts? Has F1 never heard of competitive tendering… or fostering new talent? Because Tilke GmbH is not an architecture firm. It’s architecture, civil engineering, construction and management. Tilke controls the entire process from inception to the moment the circuit is handed over to its owners. He is able to produce the circuits quickly and to budget. I don’t know of any other organisation to offers the same range of services as Tilke does. And until someone else can, he’ll keep getting the contracts. Fed up with fxxking Tilke tracks and Bernie ways. It is time that Mr.Bernie should step down from formula1 business because he sacrifices or ruins too many things to cash in on formula1 for himself (his familly) and greedy investers. Of course, he made great contributions to modernising and spread all over the world of the sport, however I have had it. This really surprises me. Russia should’ve had a Grand Prix years ago, but the plans kept on getting abandoned. 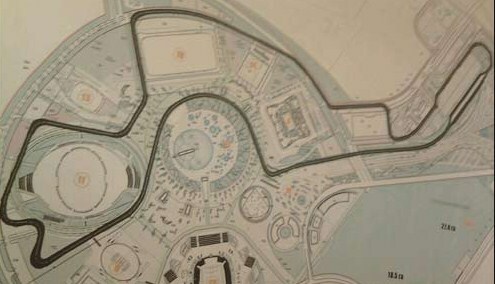 Now i’m very happy that F1 is going to Russia in 2014 and I think that once it’s complete, it’ll be 1 of 2 olympic park circuits in the world. The other being Sydney. The other thing that surprises me once in a while is that this Hermann Tilke designed track will not have his trademark track feature, a long straight followed by a hairpin turn. But anyway, I reckon that for 2014, there will be between 20 and 25 races including the inaugural GP of America at Port Imperial another Tilke designed track. If they don’t sign the new 7th Concorde Agreement in 2013, They will possibly have to drop some races to fit this one on the calendar. I reckon the track will be a very nice looking street circuit if they’re going to be spending US$200 000 000 on the circuit. They can do a lot with $200m if you think about it. The average F1 circuit will set the government back US$150m. The circuit will cost over that average for sure and it’ll be on par in terms of design with the Shanghai Circuit and Yas Marina, even while using US$200m to US$500m less than those 2 tracks if you think about it. That track will be hard on brakes and gearboxes for sure, and i’ll be expecting a lap time of between 1 min 40 and 1 min 55 secs. Overtaking will be difficult, but not impossible to do 9 times out of 10, even with DRS and KERS. The deal will go for 7 years which is about average for an F1 contract agreement from 2014 to 2020. Can’t wait to see what will go down in the inaugural race.